24 Oct. 2013/NEW YORK – FASHION shows in New York are no big deal. Nor is it a big deal to see famous faces in attendance. This, however, was no ordinary fashion show. First, Armani doesn't show in New York. If himself is spotted in the fashion tents where Mercedes-Benz Fashion Week New York goes down, expect Jesus' imminent return. No doubt, there is a promotional component to "One Night Only." What a brilliant marketing idea, no! Call it Armani's greatest hits. Or a trip down fashion memory lane. It was a star-studded, sequinned, silky and glittering affair when The Man brought his "One Night Only" show out of Europe and Asia and into the New World. To, where else, New York City. Think of it as that first Barbra Streisand retirement concert to put its importance in proper context. (See the entire video of the show at top). Armani and the girls (the models). Photos from Armani Facebook page. 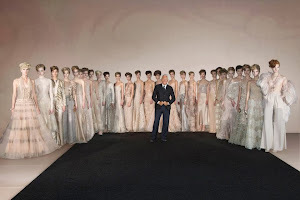 The only aspect of the extravaganza that outshown the show, which was huge, capturing every corner of the Armani design motif, from lunch to lavish affair. Yes, the lone thunder-stealer was the galaxy of stars: Lauren Hutton, Hillary Swank, Glenn Close, Leonardo de Caprio and Martin Scorcese. Yes, Martin Scorcese. Where was Richard Gere, pray tell? 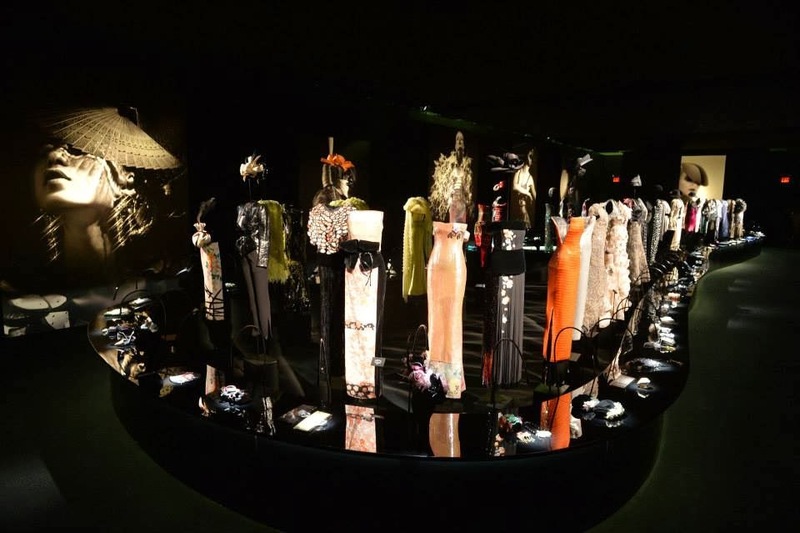 The "Eccentrico" exhibit represents nearly a decade of Giorgio Armani Privé. 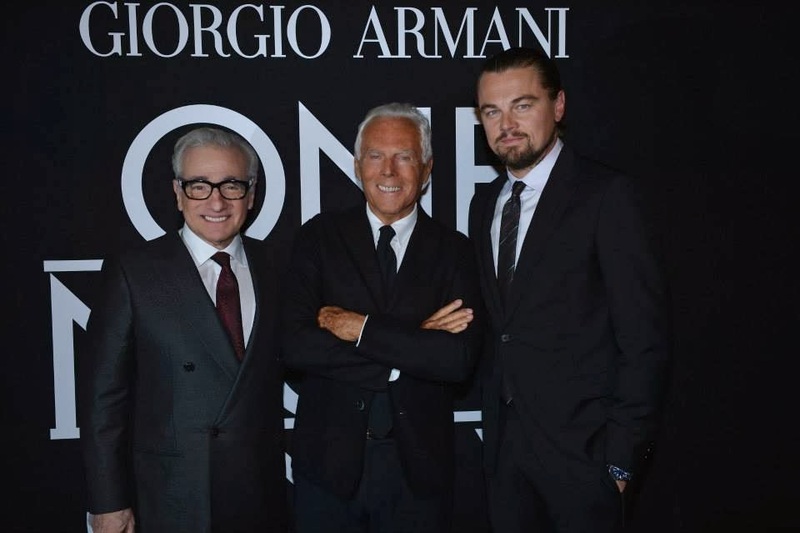 Lest one forget, Armani is the fashion designer who started dressing Hollywood characters before any of his colleagues were doing so. It started with RG's hustler in "American Gigolo" and continues with Jodie Foster’s homeland security chief in "Elysium" and Michael Fassbender's attorney in "The Counselor." Armani, center, and the boys (Marty and Leo). 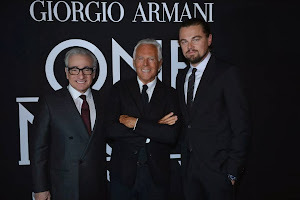 Consequently, an Armani retrospective fashion show and its accompanying "Eccentrico" exhibit, featuring eight years of Giorgio Armani Privé (http://www.bit.ly/H9H3G3), is one of the few events in the world that can attract the kind of movie star crowd that presented itself at Super Pier at Hudson River Park. Not simply starlets, reality show people and socialites, but A-list types. Of course, everybody was well-dressed. 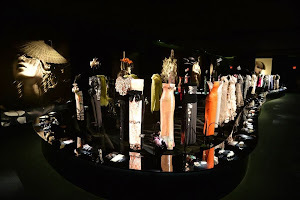 Visit http://www.armani.com/ to learn more about the "One Night Only" tour and "Eccentrico."